The 2014 Soul Train Music Awards aired last night on Centric and BET and was full of nostalgic moments as Wendy Williams emceed the event. 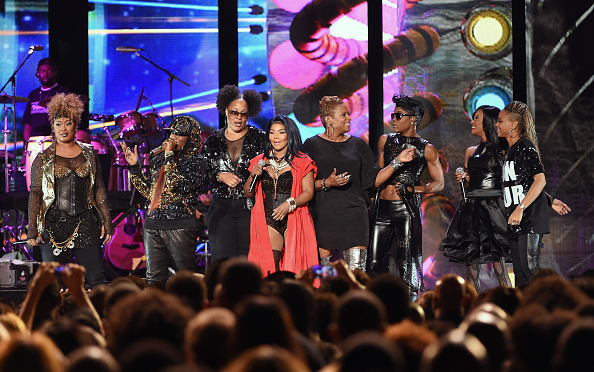 One of the highlights of the night, we told you about a few weeks ago– a reunion of the Ladies Night crew– Lil Kim, Da Brat and Missy Elliott hit the stage to perform the 1997 hit that was featured on the Nothin’ To Lose soundtrack, starring Martin Lawrence. The ladies paid their respects to the late Lisa “Left Eye” Lopes with her image in the background during her verse as they partied it up on stage.